John Guy was a merchant venturer in Bristol and throughout his life he served the city in many capacities. He was admitted to the city's Common Council in 1603 and acted as its sheriff from 1605 to 1606. In 1607 the Society of Merchant Venturers, of which Guy was a member, became interested in the colonization of Newfoundland, but decided to seek the king's approval. In 1608 Guy visited Newfoundland to select a possible location for a colony. The Privy Council accepted his petition in 1609 and, in the following year, a charter was given to the Earl of Northampton by James allowing Guy and others to proceed with the colonization of Newfoundland. Guy was proclaimed governor and was to have absolute authority over the colony. In the event of his death, the governorship was to be transferred to his brother, Philip, unless Guy named another successor. In July 1610 Guy departed for Newfoundland with 39 settlers, both men and women, as well as grain and livestock. In August he chose Cuper's Cove as the site of the colony. According to a letter he wrote in May 1611, the first year of the settlement was a success. The inhabitants, of which only four had died during the first winter, had been busy building and fortifying the settlement, exploring and farming. Guy left Philip and his brother-in-law, William Colston, in charge of the colony when he returned to England in the summer of 1611. 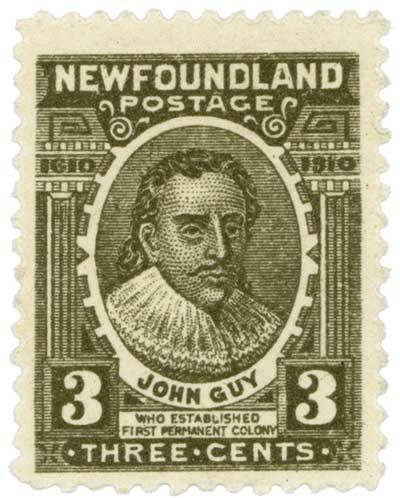 In 1910 Newfoundland issued a commemorative stamp to celebrate the 300th anniversary of the founding of Cupids by John Guy. Cupids was the 2nd oldest English colony in the New World after Jamestown, Virginia. Guy was the first proprietary governor in Newfoundland. © 2018, Newfoundland and Labrador Heritage Web Site. From 1611 to 1612 he served as treasurer of the Society of Merchant Venturers. He returned to Newfoundland with more women and livestock sometime before the fall of 1612. Correspondence dated October 1612 mentions a trip to Trinity Bay in that year, and it was on this trip that he had a friendly encounter with some Beothuks. In fact, his return was somewhat earlier; he had encountered the pirate Peter Easton in the summer of 1612. Easton agreed to leave Guy's colony alone, while Guy agreed to abandon his plans to found another colony at Renews. The winter of 1613 was harder on the colonists; eight died while several others became ill with scurvy. Guy returned to Bristol in April 1613. Although he believed he would return to his colony, whether he actually did so remains uncertain, for records show that he was in Bristol in September 1613 and again in December 1614. After complaining that he had not received the land promised to him from the London and Bristol Company, and that his colonists had not been given the wages they were owed, Guy's interest in the colony seemed to have dwindled. The land issue appears to have been resolved, for in 1626 his will named his sons and his wife, Anne, as the inheritors of his estate, including that in Newfoundland. Guy served as mayor of Bristol from 1618 to 1619. Among his other offices, he was part of the Society of Merchant Venturers' Court of Assistants in 1620 and 1621, and again from 1624 to 1628, and represented Bristol in Parliament from 1620 to 1622, and again in 1624. Guy probably died in 1629, and though there are claims that he may have been buried in St. Stephen's Church in Bristol, church records make no mention of this. The colony he left flourishing at Cuper's Cove was supposedly abandoned sometime in the 1600s, although there is some evidence it survived into the 18th century.